Experience a diamond shape that is abounding in tradition and historical charm. Imagine a diamond that offers exceptional beauty, sparkle, and durability delicately adorning your partner’s features. The pillow-shaped cushion-cut diamond evokes an elegant charm adored by celebrities and royalty alike. With rounded corners accenting a square or rectangular shape, the proportions of each cushion-cut diamond offer light disparity that radiates a kaleidoscope of beautiful colors. The classic cushion-cut diamond has been used in unique fine jewelry pieces for nearly 200 years. Until the early 20th century when round-cut diamonds took over, the cushion-cut was by far the most popular diamond shape. As the name may suggest, the cushion-cut diamond is a square or rectangular diamond shape that resembles a pillow. Traditionally, cushion-cut diamonds feature a square shape with rounded corners. However, the most popular cushion-cut diamonds are those with a slightly rectangular shape bearing a 1.10 to 1.20 length-to-width ratio. Originally, miners in Brazil first found what would become the cushion-cut shape. After similar diamonds were found in South African mines, this cut became known as the “Old Mine-cut” after the Brazilian diamond mines that shared the name. The popular modern cushion-cut diamond is sometimes described as a cross between the Old Mine-cut and a modern oval shape. As with all diamonds, your personal taste is most important when it comes to choosing the exact shape of the diamond cut. The cushion-cut diamond is made up of between 58 (traditional) and 64 (modern) facets respectively. The cushion-cut also features fantastic scintillation or flashes of visible light. This translates to a distinctive, cushion-cut sparkle. Although they are generally not as brilliant as round-cut diamonds, cushion-cut diamonds do have larger facets that allow for greater dispersion in which white light is separated into spectral colors. Originally cut with the intention of reflecting the flickering flames of candlelight, people love the cushion-cut for its capability of dispersing natural light and reflecting spectral colors back in a captivating rainbow of colors. For this reason, it was originally known as the “Candlelight-Cut Diamond”, though that style is now considered an “antique cut”. Standard Cushion Brilliant-Cut: features faceting arrangements that are very similar to Round Brilliant-cut diamonds, leading to higher brilliance. Modified Cushion Brilliant-Cut: a variation of the standard cushion-cut with an added row of facets that lie below the girdle. This style has a wonderful sparkle and tends toward a more “crushed ice” diamond look. 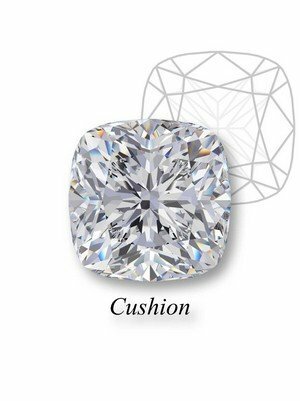 Modified Cushion Brilliant-Cut diamonds tend to be less expensive than their standard counterparts. Crushed Ice Cushion-Cut: when viewed from above, this style does not have an easily discernible facet pattern. This diamond style is often referred to as having a “broken glass” look. When exposed to light, the Crushed Ice Cushion-Cut gives off a wonderful sparkle similar to a radiant-cut diamond. Chunky Cushion-Cut: when viewed from the top, this diamond cut features a clearly-defined facet pattern. These appear similar to round brilliant diamonds, and are sometimes referred to as “Antique Cushion-Cuts”. Cushion-cut diamonds have a distinctive look especially prized by those who appreciate fine jewelry with a vintage flair. Cushion-cut diamond clarity refers to the appearance of the stone, and it notes any blemishes or inclusions. The GSL grades square diamond clarity as one of six grades – Flawless, Internally Flawless, Very Very Small Inclusions, Very Small Inclusions, Small Inclusions, or Imperfect. Using the GSL ratings for clarity can help you to understand your preferences for cushion-cut diamond clarity. The industry standard for grading cushion-cut diamond color is a system that begins with a D grade (colorless) and continues with increasing levels of color to a Z grade. To the naked eye, diamond color is closely tied to the size of the cushion-cut diamond and the setting. Small differences in diamond color are difficult to see for the human eye, but they may account for a large difference in the price of the diamond. Additionally, the setting color and material chosen for the cushion-cut diamond can make an immense difference in the color of the diamond. Ideally, a diamond should always look colorless against its setting, so keep in mind what the setting will look like when shopping for diamond color. Cushion-cut diamonds tend to retain their natural color better than other diamond cuts, making them a popular choice of cut for colored diamonds in jewelry. The proportions of a cushion-cut diamond determine how brilliantly the diamond will shine. Grading of a diamond’s cut is determined by examining its angles, facets, and polish. Overall, the goal of attaining a good cut of diamond is to create a diamond that has the correct proportions to allow the maximum amount of light to travel through it. This will give the diamond a beautiful sparkle that your partner will love. As we saw above, many variations of the cushion-cut exist -- each with unique cut features. The cushion-cut can range from having large, clearly defined facets to having a “crushed ice” look with no clearly discernible facet pattern. It is important to consider that personal preferences will play an important role when deciding between these variations, as each variety will give off a unique type of sparkle. The cushion-cut diamond, first created nearly two centuries ago, has strong roots in history and tradition. This classic cut is highly prized by antique collectors and those who gravitate toward glamorous vintage pieces. Some of the most well-known diamonds in modern history, including the Hope Diamond and the Regent Diamond, are cushion-cut beauties. Buyers attracted to a classic vintage look for their jewelry should look no further than the cushion-cut, which looks exquisite in nearly any setting. The cushion-cut has undergone several generations of development and transformation. Development toward the modern cushion-cut was fast-tracked in 1919 when Marcel Tolkowsky published his work Diamond Design: A Study of the Reflection and Refraction of Light in Diamond. In more recent practices, cushion diamond cutting has evolved to include the following practices: shrinking of the culet, enlargement of the table, and improving cut angles for added brilliance. These modern refinements have contributed to a resurgence in this dynamic diamond cut’s popularity. Cushion-cut diamonds have been in high demand for almost 200 years. These classically beautiful diamonds give off an antique feel with a modern performance backed by generations of development. Many buyers are attracted to the vintage charm of this diamond cut. Although cushion-cuts are generally not as brilliant as round-cuts, some variations of the cushion-cut give off an incomparable sparkle and scintillation. With the many variations of cushion-cut diamonds, the shape offers options for every taste: from large and chunky facets to a “crushed ice” look with no discernible facets. The process of creating a cushion-cut diamond maximizes its light-dispersing capabilities – making a beautifully dynamic diamond. For jewelry that offers a glam vintage feel with modern precision, shop amazingly brilliant Zales cushion-cut diamonds now.